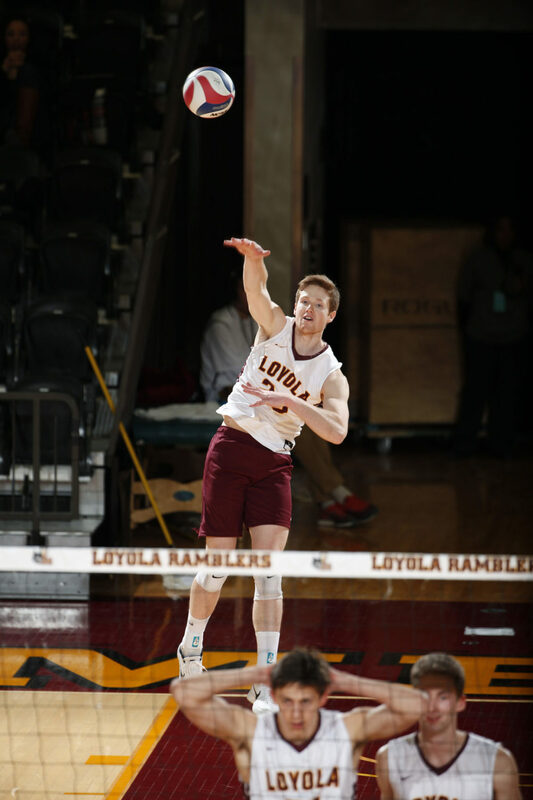 Steve Woltmann | Loyola Athletics Before he injured his ankle, senior outside hitter Ryan Jamison was fourth on the team in kills with 42, fourth in digs with 36 and third in kills per set with two. 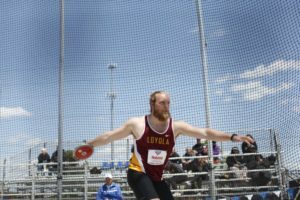 The Loyola men’s volleyball team (7-2) is without senior outside hitter Ryan Jamison, who sprained his ankle Jan. 20. With Jamison out of the starting lineup — with no timetable for his return — others will have to step up in his place. The Ramblers beat No. 15 University of California, Santa Barbara 3-1 Jan. 25 and extended their win streak to four games Jan. 27 when they defeated No. 9 California State University, Northridge 3-1. With Jamison out, head coach Mark Hulse said a few different players were fighting in practice for his starting position. Senior opposite Ricky Gevis is one of those players. Gevis, who is back after having shoulder surgery last season, put up impressive numbers during the two games, totaling 26 kills, seven digs and seven blocks. Jamison has been a key part to the team’s success this season so far, especially with one NCAA championship ring under his belt. During his absence, senior middle blocker Jeff Jendryk said he’ll need to step up. Junior libero Avery Aylsworth and Jendryk said Jamison tries to keep things light and make everyone laugh, whether it be during games or in practice. Jamison will have a different role on the team while on the bench. Watching the game from a different perspective, he can observe and give his teammates advice on what to fix. Jendryk said Jamison can still help by telling the team things they need to work on and things they are doing well. Having played with Jamison for his entire collegiate career, Jendryk has watched him develop into the leader he is today. Jendryk said Jamison was quite shy when he first started but that’s since changed. Hulse said Jamison is a good teammate and has been good for the team morale since he’s been here. In his absence, Hulse said he thinks newcomers such as first-year outside hitter Thomas Kovanic, first-year outside hitter Devin Joslyn and first-year setter Garrett Zolg can step up and help the team continue to win games. The team has a lot of depth this season, which can be a good or bad thing, according to Hulse. He said they always want to put their best players on the court who will help win the game. Although Jamison’s been a huge part of their team this year, Hulse, Aylsworth and Jendryk agree his injury won’t have a negative effect on their team going forward, especially since it’s still early in the season. This allows other players to step up and have their opportunity to play. The Ramblers are scheduled to take on University of Southern California Feb. 3 in Gentile Arena.